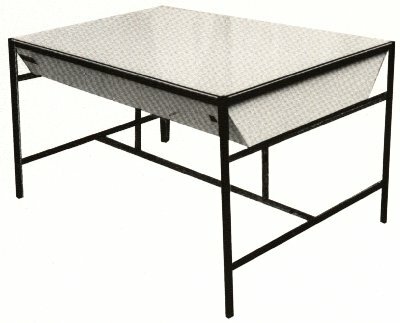 The Cirgraphics all metal light table is a budget priced unit manufactured from steel and finished in a stoved epoxy paint. The light box is sheet metal, finished inside and out in gloss white, whilst its angled sides allow knee room when sitting on a stool. The stand is of welded construction with the centre brace and 2 ends removable to allow it to be manoeuvred through difficult apertures. The top is 6mm glass over Opal Perspex and the lamps can be of your own choice but white are standard. Dimming is available if required and a 13amp socket outlet can be included for dryers, etc. Matching benches and cabinets can be supplied to special order.